Spencer Fabrications was approached by a municipality with this custom metal fabrication project. 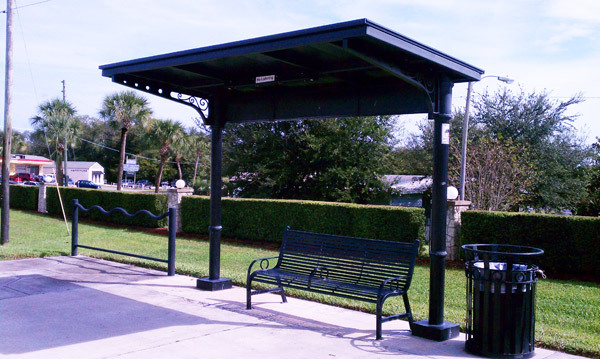 The steel bus shelter shown here features solar-powered lighting and aluminum scrollwork, which was developed to meet specific design requirements. The 6'x13' customized structure was made of steel with stainless steel hardware. Some of the features that we incorporated included a custom light enclosure for the solar lighting, vandal-resistant durable construction and paint, and the ability to withstand winds up to 140 MPH. We finished the custom bus shelter with detailed scrollwork for aesthetics that fit the local area. 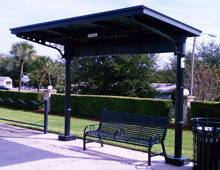 Upon development and fabrication of the shelter, we provided installation services at the customer's Florida location. The product was completed in 8 weeks and met Florida building code requirements. Contact Spencer Fabrications, Inc. to learn how we can partner with you to complete your customized project cost-efficiently and with the quality you expect. Custom Bus Shelter with Solar Lighting This 6' x 13' custom fabricated bus shelter, fabricated for the local regional transportation authority, is equipped with solar powered lighting.